January 23, 2003 Photo/story by Pat Kiely used with permission from [Kiely's] mainly Catholic Page. 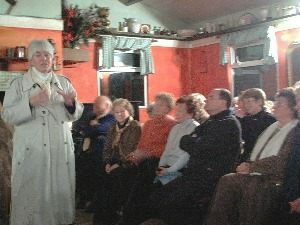 Olive Dawson recently speaking after mass and recitation of the rosary at Leahy'e Open Farm Lecture Room, Co. Waterford to a crowd of over 300 who had traveled from as far away as Kerry and Limerick to hear her talk. Olive from Kent, England who was born in Dublin, is seen here explaining about how she has been able to live only on the Holy Eucharist, without any other food or even water, since 1999, which she believes is a special gift from God. Before attending the talk I was skeptical too, but found her a very sincere speaker, full of joy and peace with a great love for Jesus and his Blessed Mother. Ms. Dawson is willing to speak at your parish or prayer group anywhere by request.